Following recipes is all very good when you have time to go shopping for ingredients and essential cooking equipment. What about when you’re hungry and just want something to eat without the hassle of going to the grocery store? Or what about when you’re moving apartments (like I did last week) and want to use up all the random foods in the fridge and cupboards? That’s when Creative Cooking comes into play! First, look for the main ingredients (some type of meat and/or vegetable). First, look for the main ingredients (some type of meat and/or vegetable). I found 3 frozen salmon filets in my freezer and a can of bamboo shoots in water (which is fairly low in carbs) in my cupboard. Second, see what kind of spices and oils (or herbs) you have to flavor the food. Second, see what kind of spices and oils (or herbs) you have to flavor the food. I luckily hadn’t packed most of my spices and some cooking oils. Third, determine what cooking equipment you have e.g., pots, pans, oven, grill, etc. I had the oven and microwave (since they were part of the apartment) and some pots and pans. Fourth, pick a recipe that you have most of the ingredients for – think of how to substitute for the missing ingredients if they are important (i.e., ingredients that really flavor the dish). 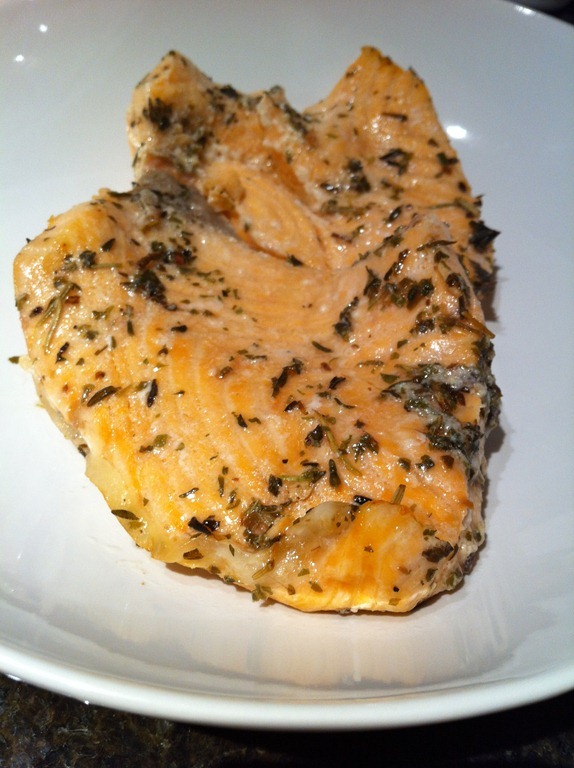 I wanted to make my salmon bake recipe, but I had no olive oil, no lemon juice, and no fresh parsley, which are 3 ingredients that really flavor the salmon. So I had to figure out some substitutes for them. 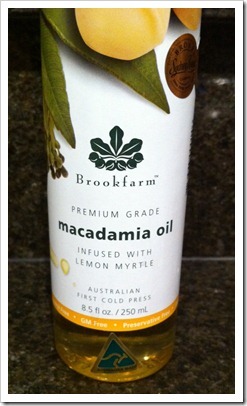 I realized after a quick glance through my collection of oils that I had bought from Amazon a bottle of lemon infused macadamia oil (pictured below) a while back and never used it. 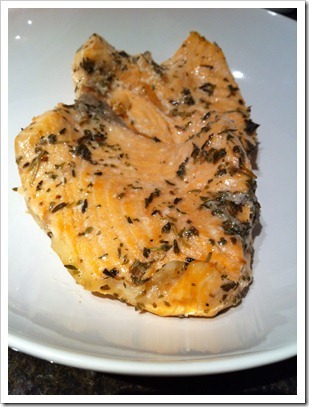 This was a perfect replacement for both the olive oil and the lemon juice! And then I replaced the fresh parsley with some dried rosemary and thyme. I felt fairly confident that this would turn out ok since the recipe was pretty simple and the substitutions weren’t too crazy. Then, I had to decide what to do with the bamboo shoots. 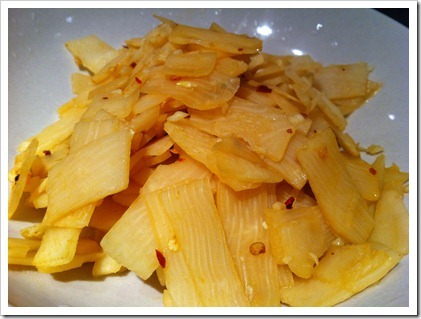 I had never cooked bamboo shoots before and had bought the 14.8 oz can of bamboo on a whim, but I remembered eating them in Chinese restaurants with chili oil (usually as a cold appetizer). So I figured that chili and bamboo shoots went well together. I therefore decided to stir fry the bamboo shoots with some red chili flakes and hot sauce (since I had no chili sauce) and then added some minced garlic, , salt, and a touch of soy sauce for extra flavor. I was a bit apprehensive about how it would turn out, but it was delicious. I was lucky that both dishes I made up turned out well; sometimes, it ends up being a disgusting mess. But, it’s fun to be creative, especially when it turns out well! Let me know if you’ve created any good or bad dishes recently by leaving a comment below.